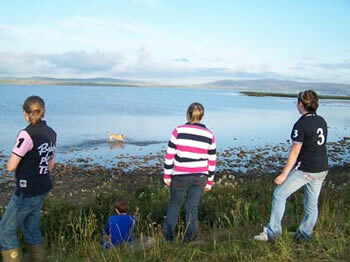 Lenahowe lodges is the ideal place for a slef-catering family holiday, whether you have Orcadian roots and want to introduce your family to the traditional Orkney lifestyle, or have memories of a working farm from your childhood, or maybe you just want to introduce to the children to a rural setting, at Lenahowe you can experience it all whilst living in luxury and having all the modern entertainment to keep the children happy. As the Lodges are located on a working farm and on the edge of the Harray loch which is rich in trout fishing there will always be something for the family to do. There are cows, sheep, chickens and a dog and during the summer maybe even lambs to be fed. 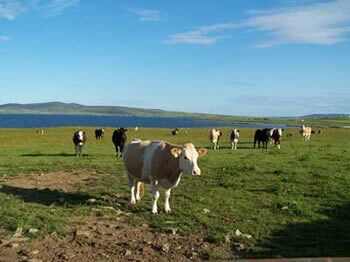 We will happily give you a tour of the farm and explain how farming in Orkney works, this can be arranged on your arrival. 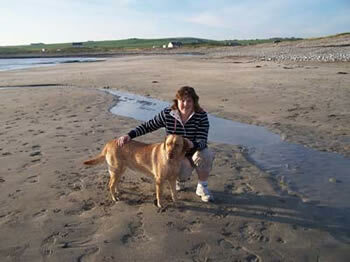 There are lots of beaches in Orkney our nearest is 4 miles away and is a beautiful sandy beach, with rock pools to explore and sand castles to build. There is a safe enclosed garden area for children to play, with outdoor toys provided, the garage has ample space to store bikes and there are even some wellie boots and jackets should you forget to bring your own. There is a well equipped utility room with washing machine and tumble drier and a separate drying room with a pulley where you can dry off wet clothes and boots after an exciting days activity. If you want to have a day indoors then there are TV’s in each bedroom as well as DVD’s, videos, books and games as well as swimming pools in Stromness and Kirkwall and a sports centre in Kirkwall. We have 2 daughters so we understand how important it is that the children are catered for, as the saying goes ”if the children are happy, everyone is happy”.